Are you looking for a reasonably priced knife block set? Then you’ll certainly want to consider this one from Hampton Forge. Read our buying guide packed with information to help you decide if it’s the right one for you. Are you celebrating a special occasion soon? Whether it’s a birthday, anniversary, housewarming or wedding that’s fast approaching, there surely is one ideal gift you can give the celebrant. Surprise him or her with the Hampton Forge Knife Block Set. This is not that expensive, so it is certainly within your budget. Anyone who will receive this knife set will feel happy to be the new owner of a high-quality kitchen tools set. You’ll definitely be a proud giver of knives that are all functional, easy to handle and safe to use. This is a price that is so within your budget. You don’t even have to worry about the shipping fee as you can get this product with free shipping. It consists of a chef’s knife, a bread slicer, a Santoku knife, a utility knife, a parer, and steak knives, among others. All off these high-quality knives stand safely on a durable magnetic block. 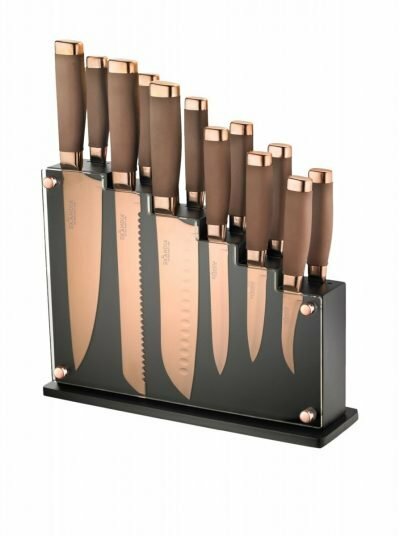 If you really want a loved one to feel very special come special occasion, give him the Hampton Forge Knife Block Set. This is a top-of-the-line kitchen tool any homemaker and cooking enthusiast will love. The set features 12 pieces of all-purpose knives and a durable block. This means that, food preparation will be a lot easier and more effortless when one uses the knives in this set. Even the price is reasonable so, you definitely won’t regret spending for it as a present for a special person. I’m sure you know an aspiring home cook that would love something like this. Don’t miss your chance of showing someone how much you value him or her. Buy him something he can treasure for many years. If you take a look at the customer reviews on Amazon, you’ll notice that there are actually some issues with durability, particularly with rusting. If you’ll take care of them well (dry them off after washing every single time), then it shouldn’t be a problem. Maybe you are not that type of person? 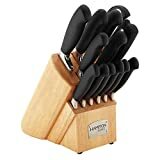 Then you’d do well to consider some of the higher-quality options here: The Best Knife Block Sets. What about a Top-Quality Chef’s Knife? Some people prefer a set of knives like this one from Hampton Forge, while others prefer a single chef’s knife for most purposes and then perhaps a small paring knife to go along with it. Experience with cooking: it’s usually only professional chef’s who will bone a fish, or pare something very precisely. The average home cook needs just 1 or 2 sharp knives to get the job done! What are your thoughts about this knife set? Leave a comment below and let us know.